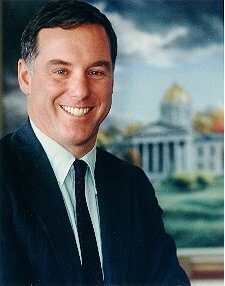 Although often portrayed as progressive, former Vermont governor and Democratic presidential candidate Howard Dean falls short on several issues important to progressives, with the Middle East being one of the more glaring. True, Dean is one of the Democratic presidential hopefuls who opposed the invasion of Iraq (along with Ohio Rep. Dennis Kucinich, conservative Sen. Bob Graham, former Illinois Sen. Carol Moseley Braun, and Rev. Al Sharpton), but he is closer to a hawk when it comes to Israel/Palestine and U.S. policy toward Iran. In a major foreign policy speech earlier this year, Dean, while calling for an end to Palestinian violence, did not call for an end to Israeli violence, let alone an end to the illegal Israeli occupation. And when asked whether his views are closer to the dovish Americans for Peace Now (APN) or the right-wing, Sharon-supporting American Israel Public Affairs Committee (AIPAC), he stated unequivocally in an interview with the Jewish weekly The Forward, "My view is closer to AIPAC's view." "At one time the Peace Now view was important, but now Israel is under enormous pressure. We have to stop terrorism before peace negotiations," he said. Similarly, Dean's official campaign position on solving the Palestinian-Israeli problem is that "terrorism against Israel must end," but there is no mention of the Israeli violence that has resulted in over 2,391 deaths since September 2000. Last December, Dean told the Jerusalem Post that he unequivocally supported $8 billion in U.S. loan guarantees for Israel. "I believe that by providing Israel with the loan guarantees ... the US will be advancing its own interest," he said. His unconditional support for the loan package, in addition to $4 billion in outright grants, went further than even some of the most pro-Israel elements in the Bush administration, like Paul Wolfowitz, who wanted to at least include some vague restrictions like pushing Israel to curtail new settlements and accept a timetable to establish a Palestinian state. On the illegal Israeli settlements, Dean seems to be waffling of late. A pro-Dean blog quotes his campaign as calling for the ultimate removal of only "a number of existing settlements." (The link back to the official site was no longer operational as of this writing.) However, in what may signal a softening of his position to woo progressive voters in the just passed MoveOn.org PAC Democratic "primary" vote, Dean called last month for "ultimately dismantling the settlements." So which one is it? In fact, Dean's alignment with AIPAC and their right-wing politics goes much deeper than aligning with the groups platform. Last year, he named Steven Grossman, a former AIPAC head, as his campaign's chief fundraiser. Soon after, he flew to Israel on an AIPAC-sponsored junket. And in a telling statement about whether a President Dean would act any differently toward Iran than the Bush neocons, Dean also told The Forward, "The United States has to ... take a much harder line on Iran and Saudi Arabia because they're funding terrorism." In fact, Dean thinks President Bush is way too soft on Iran. In a March appearance on CBS' Face the Nation, Dean explained that "[President Bush] is beholden to the Saudis and the Iranians," something that would certainly come as a surprise to the current regime leaders in Iran who've been labeled as part of an alleged "Axis of Evil" by the current U.S. president. Dean even left open the possibility of preemptive strikes against that country in that interview, adding that "we have to be very, very careful of Iran." Once again, sounding very much like President Bush, Dean charged during a New Hampshire campaign stop this month that Iran (along with Saudi Arabia, Syria, and Libya) was "funding Palestinian terrorists and fueling terrorism throughout the world." Apparently, there is another side to this "anti-war" candidate. When combined with his dubious record as governor on issues like welfare "reform" and gun control, it may be prudent for progressives to think twice before casting their vote for Howard Dean.